The medical industry utilizes Hot isostatic pressing (HIP) to improve the properties of cast cobalt chrome, titanium and stainless steel implants. HIP processing improves strength and removes porosity creating a smooth, pore free wear surface that reduces friction and the potential for corrosion. 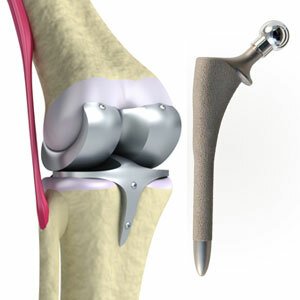 Cobalt chrome knee and hip implants are HIPped to protect against the body's high dynamic stresses and corrosive environment. In addition, hot isostatic pressing also enhances the bonding of biocompatible coatings. HIP densified castings show improved strength, ductility and fatigue life with significantly less variation from casting to casting. The improved and more consistent material properties reduces part over design. This also decreases quality assurance costs and opens new applications. Hot isostatic pressing salvages castings scrapped for internal porosity - in fact, it is the only effective way to repair porous castings. Casting yield is significantly improved, resulting in lower costs and more effective utilization of raw materials.